There are basic two roulette bet categories that you need to know about: roulette inside and outside bets. Inside bets refer to the inner area figures of the table, where bets are placed for every number. Outside bets refer to the betting alternatives on the outer side of this table. Inside bets consist of certain numbers inside the table or on its boundary. All you have to keep in mind is that the bet summary needs to equal the minimum of the board. Straight bets are the basic roulette bets. Just choose an integer and place your chips on it to get the chance to get 35:1. Split bets are also allowed. This means that you can place individual bets on two different numbers, provided those figures lie next to one another on top of the table. All you have to do is put your chips on the line that lies between them. This will reward 17:1 for whichever figure appears. Street bets are similar to split bets. They allow you to place equal bets on three different numbers. Just place your chips on the outer line of whichever numbers you wish to make a bet on. Corner bets are a new kind of combination that let you bet on four adjoining numbers. Just place your chips where your choice of four numbers connect to specify your bet. Sometimes, these are called square bets, too. The reward for these bets are 8:1. 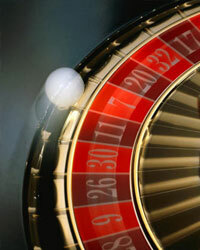 Roulette outside bets refer to bets remaining outside the numbers zone. With outside bets, every bet needs to match the minimum of the board and any bid rate cannot be merged. Also, outside bets cannot be added to the total of your inside bets. As outside bets, you can bet on either red numbers or black numbers. Just put your bet on the red or black diamond on the table. This bet is actually very common because it is easy to understand that you have half a chance of winning with it. This bet pays out even money. On a similar note, even bets are based on the number being even or odd. Because zero isn't even or odd, however, it doesn't count. To do this, just place your chips on the even or odd square.